A bit of Texan graphic imagery surrounding the giant logo. A photo image of two ‘Bubble’ Chips and the flavour written in a Texas Stamp style font. That’s it. This could have been designed in the 1930s. A meaty sort of Crunch that was more like a biscuit or a slightly aged cracker than a Crisp. These 'Bubble Chips' featured rounded edged hexagonal shapes. They had bobbly surfaces and a touch of seasoning. They look a little like PopChips but also a little like Discos, which is also a KP snack. The reverse of the packet admits that the contents are ‘Reformed’ Potato Snacks. This may mean they were naughty Crisps but now they are better behaved. Or it might mean they are made of Potato plus chemicals and other ingredients. The flavour was a little like Oxo or another such Beef stock cube. T-Bone Steak as a description, requires a certain level of imagination. 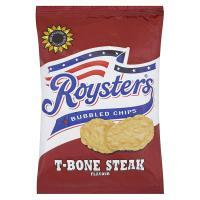 They were quite tasty Beef Stock flavoured Crisps though!